Advanced heat exchanger, air outlet, compressor, and inverter technology provides the world's highest energy efficiency. In areas where electricity is limited to four to six hours a day due to unstable supply, even users with a small capacity generator can continue to use household appliances together with the air-conditioner without disruption. LG's revolutionary inverter technology offers powerful yet silent performance while also greatly lowering energy consumption by as much as 60%. The cool airflow reaches the distance of 10m to all corners of the room, keeping the space cool and comfortable regardless of outside temperature. The optimized design of the air outlet provides more powerful airflow, which cools the room by up to 5 degrees in just 3 minutes. The combination of True Protection (AVS: Automatic Voltage Switcher + Volt Care), and the gold fin in the exterior unit all continue in the improved durability of LG air conditioner. LG's advanced Volt Care technology protects products from lowhigh voltage variations and keeps the air conditioners running. Volt care is composed of LVS and HVS; LVS allows products to operate at low voltage and HVS ensures safely against high voltage or power surges. LG PCB (Power Circuit Board) was upgraded to increase its ability to withstand voltage variations, thus ensuring safety against high-voltage of power surges while ultimately strengthening the air-conditioners overall durability. Due to the unstable infrastructure, the supply of electricity sis usually lower than the demand. This is more frequent during the hot summer when the usage of electricity is high. 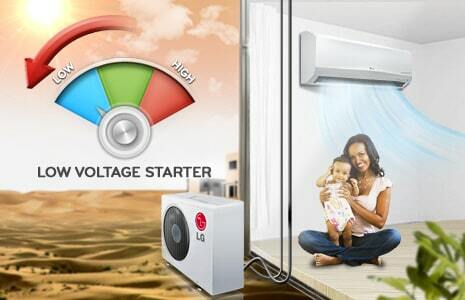 LG air conditioner even operates at lower voltage in lower temperature. The Gold Fin™ prevents the surface of the heat exchanger from corrosion and wear. Gold Fin™ is an anti corrosion coating on the surface of the heat exchanger. This ensures that the surface is more resistant to corrosion and enhances the durability of heat exchanger for a much longer period. LG air conditioners operate at the world's lowest noise level, yet maintain an incredible capacity for dehumidification, allowing LG ACs to provide the most comfortable environment. LG air conditioners operate at low sound levels, thanks to LG's unique skew fan and BLDC motor technology which eliminate unnecessary noise and allow for smooth operation. The deep sleep mode will increase the temperature by a degree every 30 minutes, and eventually by 2 degrees per hour to create a more comfortable and sound sleeping atmosphere. Various filtration system protects the user from all harmful substances including odor,bacteria,allergen,virus and micro-dust. 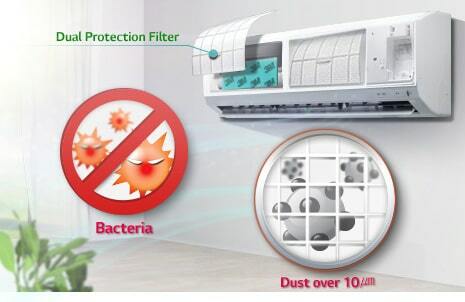 The Dual Protection Filter captures dust size over 10m and bacteria. 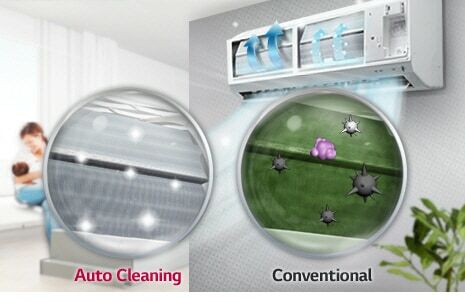 Installation has never been easier as with the delicately designed installation elements of LG air conditioners. LG air conditioner are designed for easier and more efficient installation, regardless of the surroundings and the number of persons involved in the installation process. By reducing the manpower and time required for installation, it is now possible to install more air conditioners at more homes in a shorter period of time.